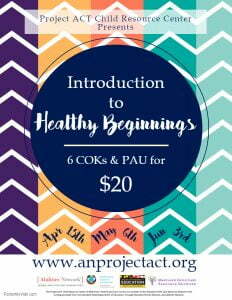 Participants will identify the developmental needs of infants and toddlers, define and plan for responsive caregiving and determine how “Healthy Beginnings” can be used in an ECE setting. Partakers will be able to plan and assess for infants and toddlers. Each session of this series consists of a two hour training and a one hour workgroup. Participants will be eligible for 1 PAU at the end of the series.